Hope everyone is having an awesome 2016 so far! 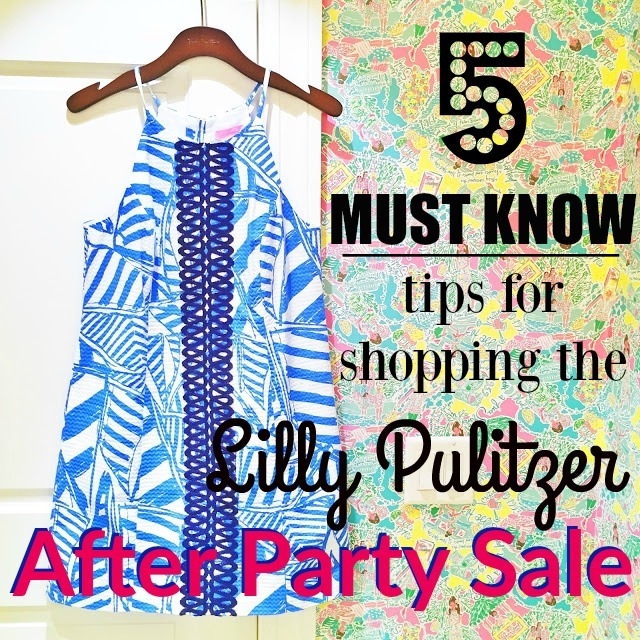 I have some realllllyyyy exciting news to share: the Lilly Pulitzer After Party Sale IS COMING! Monday January 4th at 8am ET the Lilly Pulitzer After Party sale will begin so get your wallets and computers ready, this is by far the BEST sale of the year. Being the seasoned pro that I am, I've created a list of 5 must know tips for shopping the sale. Trust me, you'll want to read this before the big day comes! THIS IS THE MOST IMPORTANT STEP!! Create an account before the sale starts so you don't have to waste time and miss out on some new goodies. It's super easy to create an account (there's also a step by step process here) and if you already have one created, great! Be sure to triple check all your information is up to date. 2. Read Up and Get Ready Knowledge is power and you want to know everything you can to make sure to get all the best deals on Monday. So while you're here, getting ready make sure to read over this FAQ about the sale. It will tell you everything you need to know and even go over some things that are new! Other things you can do to prepare yourself: update your information! I'm not kidding. The worst feeling in the world is to go to check out and remember your old credit card is still on file. Also, here's a pro tip: login the day before. It will keep you logged in for the sale and ready to go at 8am ET! The site usually shuts down the night before and doesn't re-open until the sale begins. Time is of the essence here and you don't want to waste precious shopping time on logging in! Life can get busy, Sundays are always hectic and there are just some things you forget! So set a reminder for Monday morning. Heck, set a few reminders Monday morning and maybe even some the night before (have to rest up). In the past I usually wake up around 7:30 and just refresh every 5 minutes until 8am. I know, might sound crazy but it works for me! Lilly Pulitzer Top / Lilly Pulitzer Jeans / Shoes / Sunglasses / Earrings / Watch / Ring / Necklace 4. Refine Your Search You're IN! Now it's time to shop the sale. The most productive way I've found to do this is to refine my search parameters. I know my size in dresses, tops and bottoms and so I'll filter it down to make sure I'm only looking at things that are in my size. Unsure about your size? 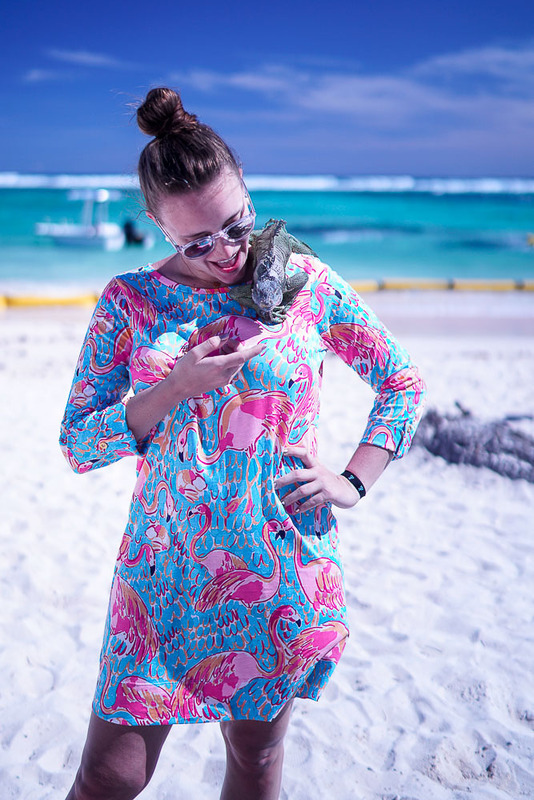 Lilly Pulitzer has this great technology called True Fit that can find your ideal size based on a 60 second survey. You can take it here. I've worn Lilly for as long as I can remember and I can say that they run pretty TTS. I'm a 6/M in the dresses and tops and a 8 in bottoms for reference. If you're still a little weary about sizing, find your local store and try some things on! 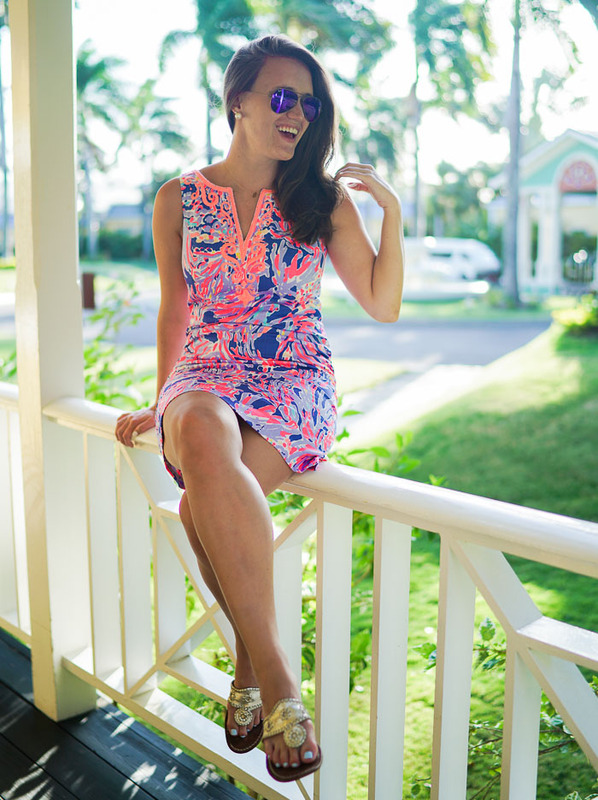 Lilly Pulitzer Dress c/o / Sunglasses / Earrings 5. Be Quick and Check Out Once They are keeping the same format as the last one (which differs from previous sales). At 8am ET when the site is up, you'll be placed into a virtual line and a number of people in front of you. I remember last year my number seemed so high but in reality it only took about 5 minutes to get in. So don't worry if you have a large number. They will get everyone in! Pro tip: DON'T open multipule tabs on the same browser -- it will kick you down to your last given number. Learned that the hard way. But you can shop via your computer, tablet or iPhone/app to give you the best chances! But because of this the format of checking out is different. Since you're in the line you're given a virtual number to the company and once you check out you go to the back of the line. So you want to only check out when your final cart is complete. Once you do so, you'll be placed in the back of the line. Also be aware that things in your cart are not guaranteed until you completely check out and pay. It's a bit of a catch 22 but I promise it's a great system and you'll walk away very happy! Love the Lilly sale every year, I've found some things I was lusting after for full price! I can't wait to see if I score anything this year! Good luck, may the odds be ever in your favor! Exciting and innovative Chicago corporate events are tailored for our clients to powerfully illustrate the importance of strong teams, and a strong culture. These high impact and challenging events can be delivered for the entire company.